Le Cordon Bleu Chefs share a delicious recipe for chocolate marshmallows which are easier to make than you might think. To discover another dimension to this ingredient, Le Cordon Bleu Chefs have prepared a soft chocolate marshmallow coated in a thin layer of crisp chocolate. Note: You will need 1 square metal frame (cake ring) 17 cm square x 4.5 cm high. Line a baking sheet with parchment paper and place the metal frame on top. Soften the gelatin leaves in a bowl of cold water. Cook the water, sugar, glucose and 100 g of Trimoline until 113°C is reached. Pour over the 110 g of Trimoline, add the softened gelatin and whisk using an electric mixer. When lukewarm, add the cocoa liquor and mix well. Pour into the metal frame and spread to form a smooth surface. Sprinkle with a mixture of equal quantities of powdered sugar and potato starch, leave to cool. Flip the marshmallow over and sprinkle the other side. Cut into 36 x 2.8 cm cubes. Dip the bottom half of the marshmallows in the tempered chocolate and place on a baking sheet lined with parchment paper. Spread a thin layer of tempered chocolate onto a sheet of plastic film. Cut into small 1 cm squares when the chocolate has set. Sprinkle with gold powder. Chop the milk couverture chocolate and place into a bowl. Bring the cream to a boil and pour over the chopped chocolate. Stir until smooth. Transfer to a piping bag fitted with a round tip. Refrigerate until the ganache is firm. 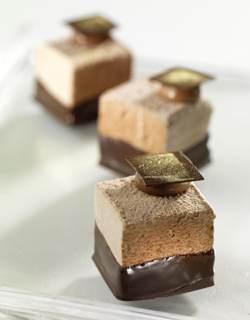 Using the piping bag, pipe a small ball of ganache onto each marshmallow and decorate with a chocolate square.